Paper Flowers: a nightingale sings in George Square? If a nightingale ever sings in Glasgow’s George Square, I’ll bet it sounds just like Anna MacDonald. Her voice has the same combination of urgency, brilliance and beauty that creeps into your sleep in the early hours and makes you wonder if you’re still dreaming. On the epic “Matty Groves”, one of the standout tracks on her second EP Paper Flowers, it soars and shimmers as if ricocheting off the majestic buildings and echoes into the distant night like a siren call to another world. This traditional folk song is a sad and violent tale that builds on a simple melodic hook. In MacDonald’s feverish version, she seems to meld the bitter rivalry of the street fight with doomed love and murder in a mixture of urban imagery and pastoral folklore. MacDonald is a gifted songwriter, too. Her ballads – the title track, the atmospheric “Glasgow Rain” and “Naj’s Song” – complement another traditional number, “Banks of Inverurie”, as sweet, melancholy paeans to hearts broken against the gritty background of a city that is clearly a major influence on her work. The texture is an arresting weave of Scottish and Gaelic traditions, with a dash of English folk. A full album would be welcome, and soon. These are heady days for the female Scottish troubadour. 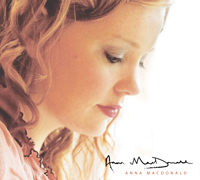 That other notable MacDonald, Amy, already on to her third album, has helped to open a door into mainstream pop music for what seems like an army of young women, each with their own blend of traditional and modern musical tastes. Where Amy favours fierce, guitar-driven narratives in the manner of her breakthrough hit “This is the Life”, Anna is deceptively gentle and contemplative, that angelic voice telling quietly bleak truths about the realities of waning love and loneliness. There is plenty of room for them both.